"This is one of my mother's cake recipes for a birthday. I love this recipe and it tastes great." Preheat oven to 350 degrees F (175 degrees C). Grease and flour one 9x13 inch pan or three 8- or 9-inch round layer cake pans. Cream the butter and sugar together until smooth and fluffy, about 5 minutes. Add the egg yolks one at a time, beating after each one. Mix in the vanilla extract. Sift together the baking powder, flour, and salt. Add the flour mixture to the creamed mixture in three batches, alternating with the milk. Blend after each addition. Scrape down the sides and bottom of the bowl and beat an additional minute. In a separate bowl, beat the egg whites with a dash of salt until stiff peaks form. Fold one third of the egg whites into the cake batter to lighten it; gently fold in the remaining egg whites. Pour batter into prepared pan(s). Bake in preheated oven until cake springs back when touched lightly with a fingertip and a tester inserted in the center comes out clean. Cake layers may be done baking after 25 minutes; a 9x13-inch cake may take 35 minutes. Cool on wire rack. 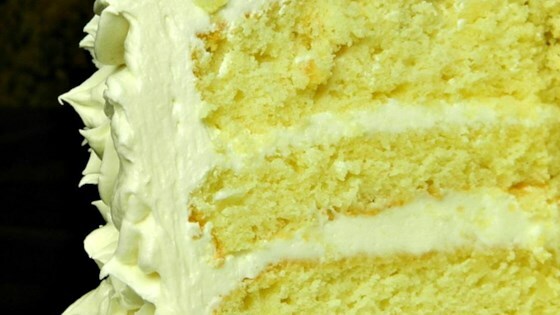 See how to make a simple homemade yellow cake. A good basic recipe. It tasted good.